Weathering defines the set of physical, chemical, and/or biological processes which decay and break rock down into smaller pieces. Weathering processes can act independently and in concert as well as at different scales of observation. Erosion is the transport of the weathered debris, often by wind and water, away from the cavity interior. Particularly in arid regions where wettings are infrequent, regolith, soil, and weathering products cover cavern floors (Dragovich, 1969; Martini, 1978, McBride and Picard, 2004). Biological Weathering. By secreting organic acids in the shape of a halo, colonies of microorganisms chemically weather biotite. This biochemical process leaves behind an ellipsoidal area, depleted in ferric oxide cement, which is more readily weathered and eroded. While it might be possible that “scattered colonies of microorganisms cause the development of alveolar cavities [tafoni]” (Mustoe , 1971), it is probably more likely that larger organisms such as pholads (Pholas dactylus of the family Pholadidae) create borings that are the nucleation pits of some tafoni (Matsuoka, and Yano, 1989). 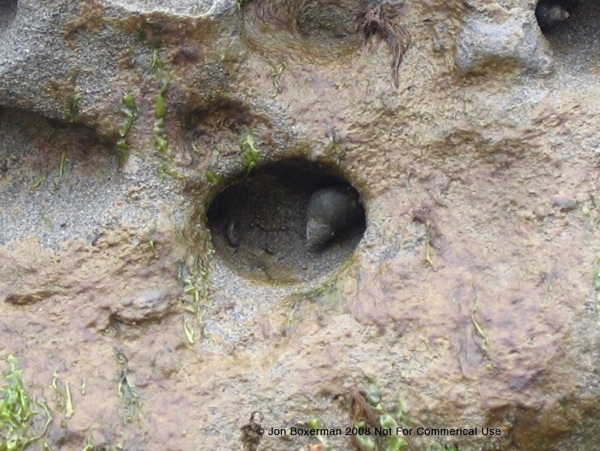 Pholads biochemically initiate pits in rocks in intertidal areas that may evolve into tafoni when mollusks (and probably clams, sea urchins, and other marine and non-marine organisms) digest micaceous minerals like biotite in the rock by excreting biochemicals. 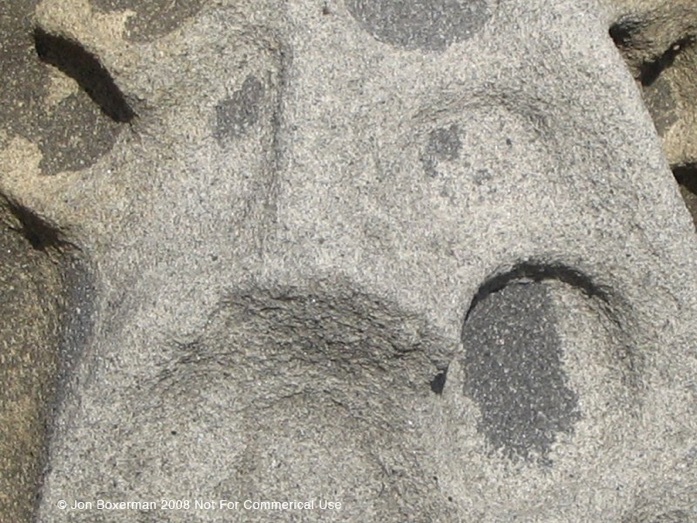 Borings enlarge by the physical action of their bodies, erosional forces wearing away cavity interiors, and perhaps by differential weathering factors. Pholad are a type of bivalve, or mollusk and the borings they create may be prone to cavernous weathering and erosional processes and may differentially enlarge to resemble tafoni. Chemical Weathering. Chemical weathering processes associated with tafoni development tend to include hydration (e.g., anhydrite to gypsum), hydrolysis, and the exchange of cations between mineral solutions and the host rock (Rodriguez-Navarro, Doehne, & Sebastian, 1999). 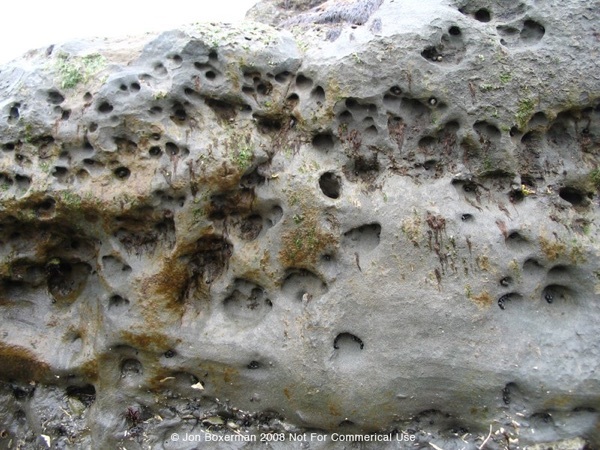 Sources of moisture promoting tafoni formation can be from saline-rich sea spray and splash, condensation from the air, melted snow, groundwater, and rainwater. 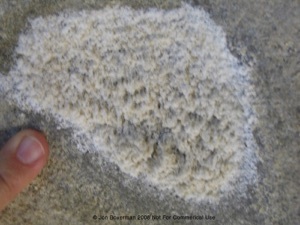 The decomposition of feldspar to clay minerals, the chemical etching of quartz by salt, and the detachment of iron from biotite appear particularly important in the chemical weathering of tafoni. Physical Weathering. 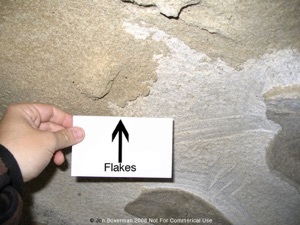 Physical, or mechanical, cavernous weathering processes generally refer to the grain-by-grain destruction of a rock (also known as granular disintegration). Physical weathering is invoked by researchers more often than biological or chemical weathering when describing creative tafoni forces. 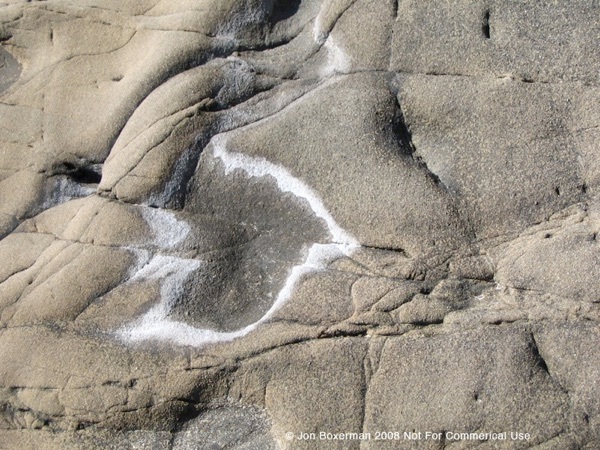 Like granular disintegration, delamination of thin flakes of rock (also known as scaling and negative exfoliation) is augmented by salt crystallization pressures (salt weathering) as well as by hydration pressures caused by mineral swelling.